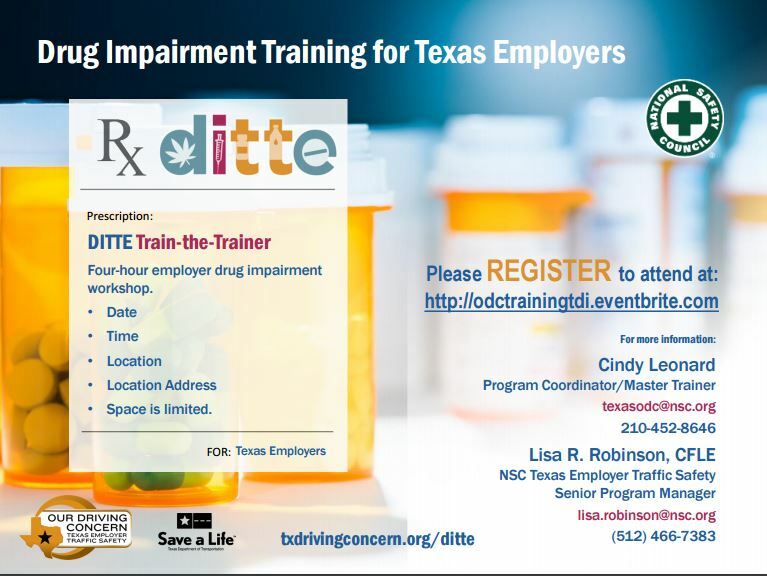 Make plans now to attend Drug Impairment Training for Texas Employers (DITTE). This training is provided free from Our Driving Concern through a grant from the Texas Department of Transportation. Develop (or improve) company drug policies, programs and practices. Webcast training consists of three 45-minute sessions, each followed by a 15-minute break, and then one 30-minute session. 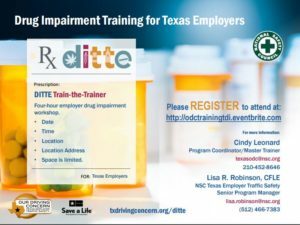 Upon completion of all four sessions, participants will receive a certificate via email and will be sent a flash drive of the curriculum (Texas employers only). Wednesday, June 12: Webcast training from 8:30 a.m. to noon. COST: This education is grant-funded by the Texas Department of Transportation. There is NO CHARGE to participants. LEARN MORE: Contact Our Driving Concern Program Manager and Master Trainer Cindy Leonard.